You are currently browsing the tag archive for the ‘nesting’ tag. A recipe borrowed from my preschool mentor teacher, who made this as a mid-morning snack for the preschoolers every year. A snack that had me hooked. 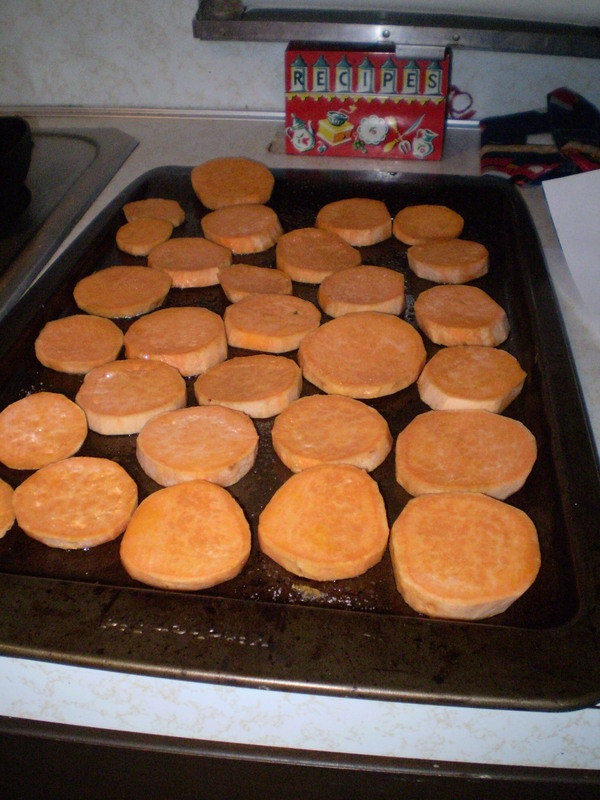 1) Peel yams/sweet potatoes/whatever they have at the ACME. 2) Using the largest butcher knife/cleaver in your collection, hack into those tubers. 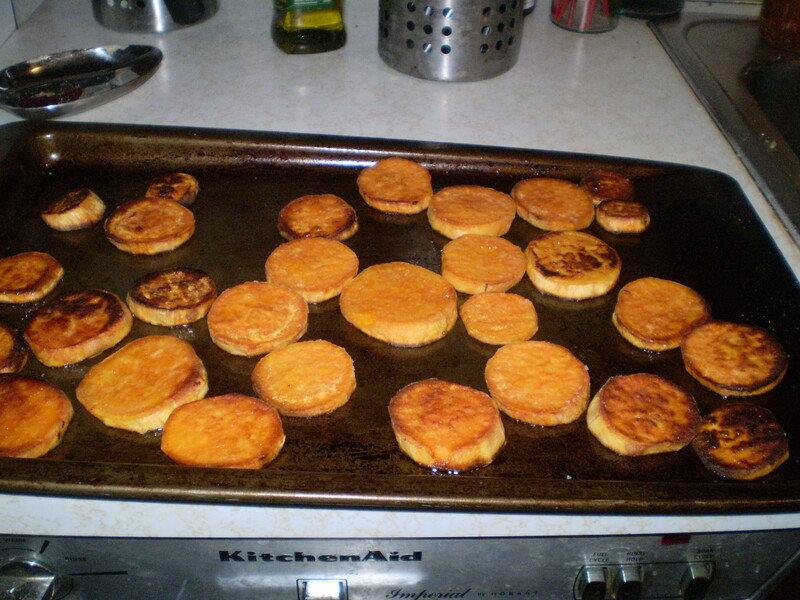 Cut them into bite-size chunks, or steak fry shapes, or, as Mr. Apron chose to do this time, circles. 3) Toss the chunks/fries/circles liberally with olive oil and kosher salt. 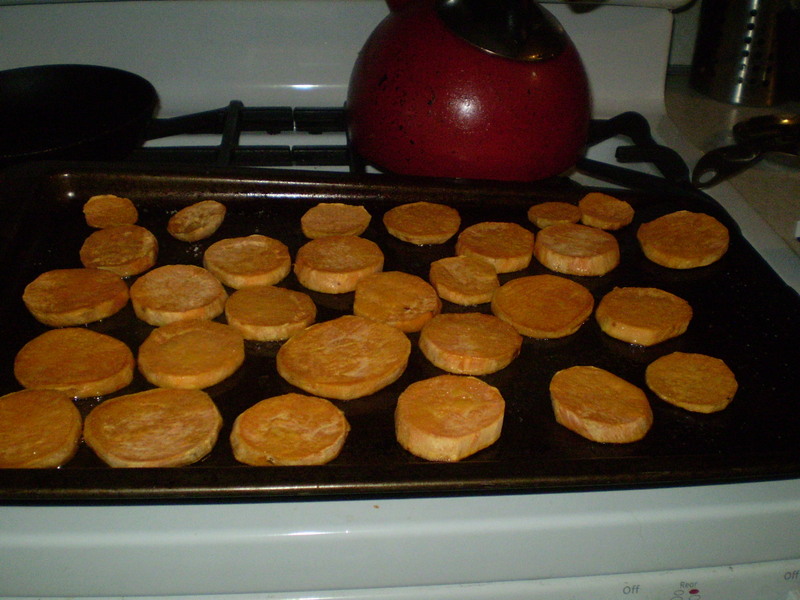 4) Spread on a cookie sheet. Roast in the oven at 375 degrees, checking and flipping at 20 minutes. Depending on size/shape, they may take 35-45 minutes total. 5) Enjoy. 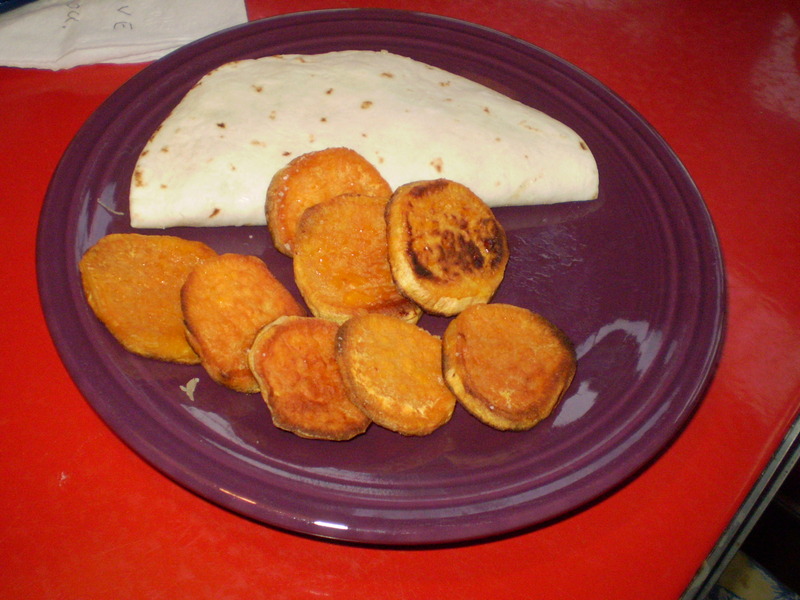 Serve with ketchup, barbecue sauce, ranch dressing, or plain! When you read that your fetuses have approached onion size, it makes sense that your last pair of shorts are fitting only by hanging onto your hips by the narrowest of margins, drooping suggestively below the belly bump. What do you need? Fried food. What better to consume on a 100 degree day? 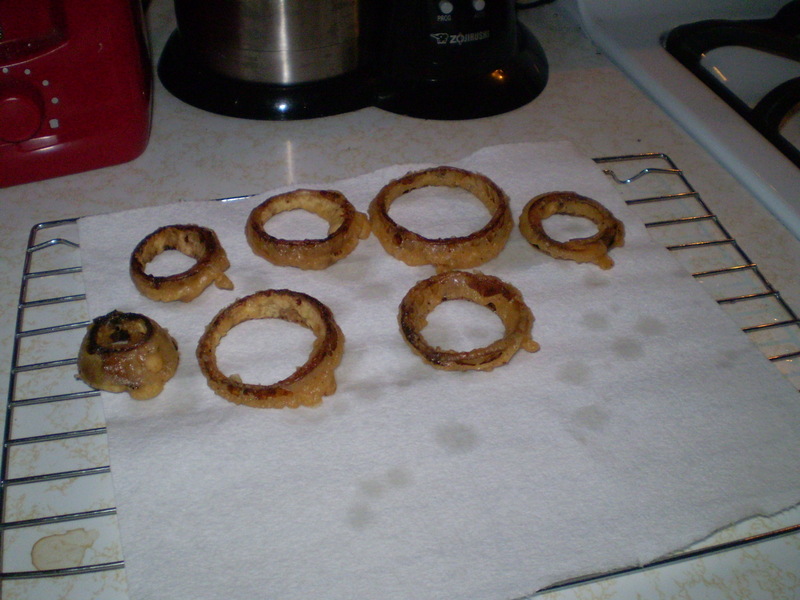 Onion rings, made with the kitchen air-conditioner (c. 1980) doing its best to combat the golden fried heat emanating from the stove-top. Having no ready recipe (bread some onions in some batter, fry them), I found something that used only ingredients we had on hand. It’s a good a way as any to choose a recipe. Mix dry ingredients; add water and egg. Batter will be thin. 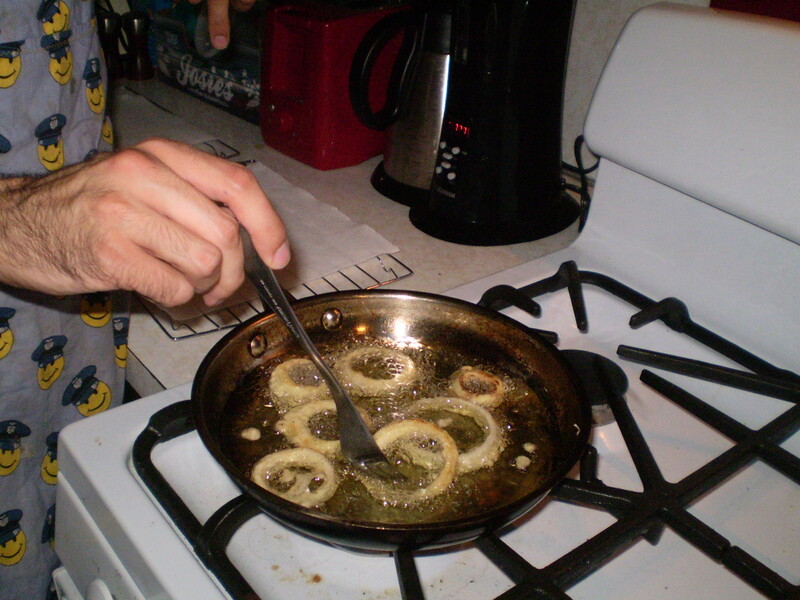 Dip onion rings in the batter and deep fry. 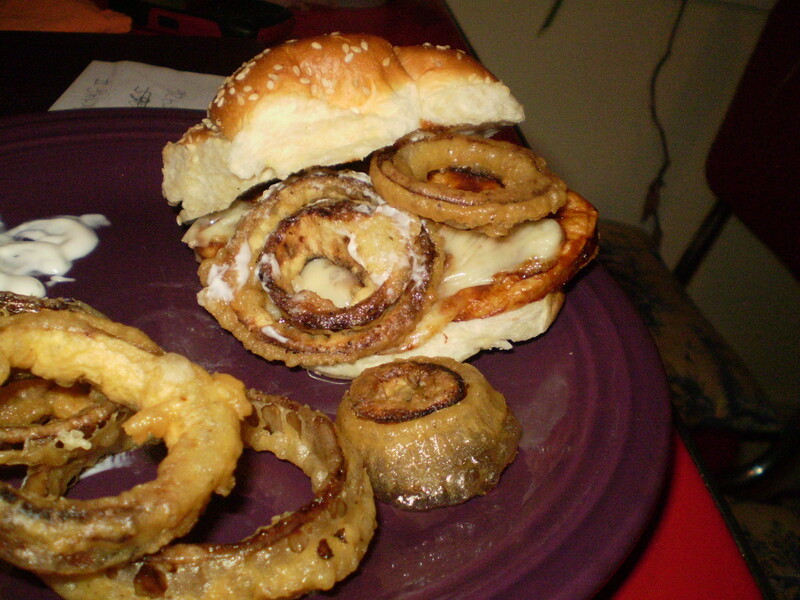 Aside from not having a deep fryer, so the bottoms became a little discolored (not burned, just not aesthetically restaurant style), we both decided these were some of the best onion rings we had ever eaten. 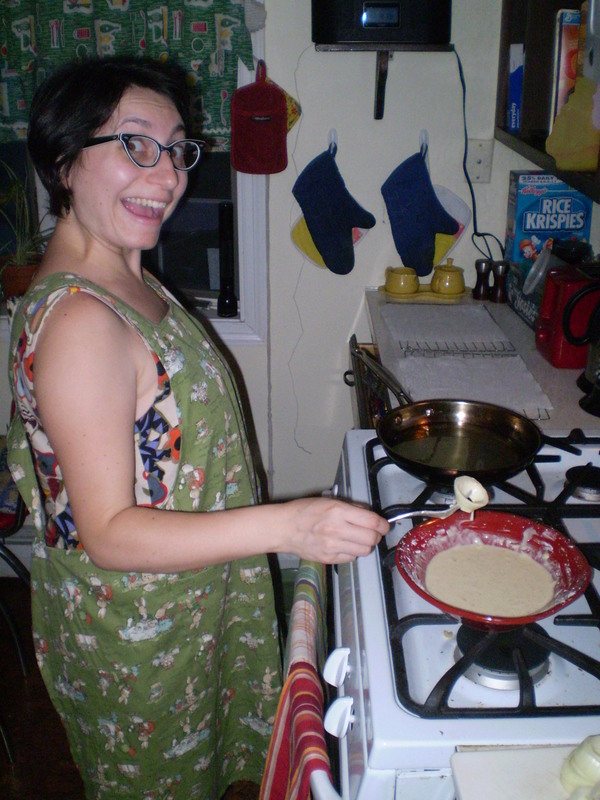 The batter didn’t dry out, and, more important, it didn’t separate from the onion part entirely when we bit into it. I hate that. You’re left with a mouthful of onion, and an empty shell of batter, which is just not the same as having both flavors combined in one glorious bite. I was a little skeptical of adding the egg and water to the dry ingredients, as, when I fry battered things, I’m used to dipping in the egg, then in the batter. But it totally worked. And only seemed to get better as the cornstarch had a chance to thicken (I’m guessing). Here are some in-process pics to whet your appetite! 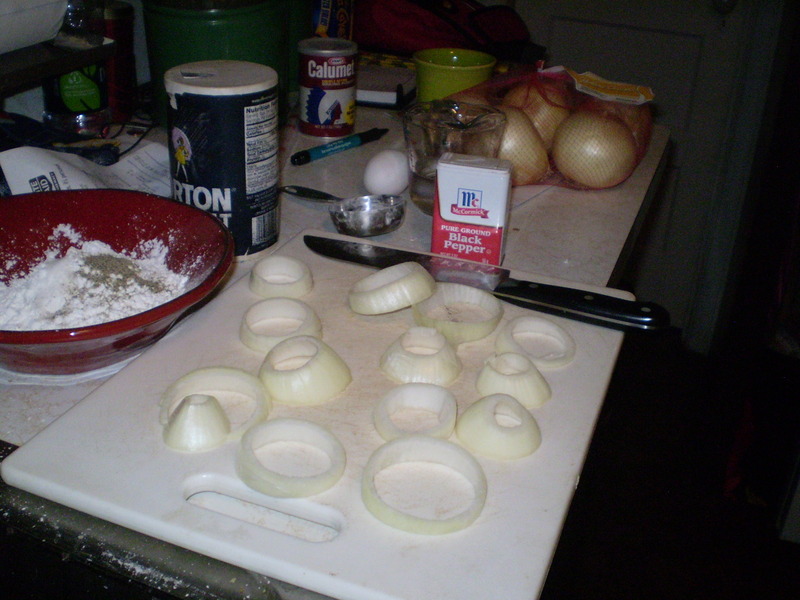 Onions, all sliced and ready for the fry-o-later. 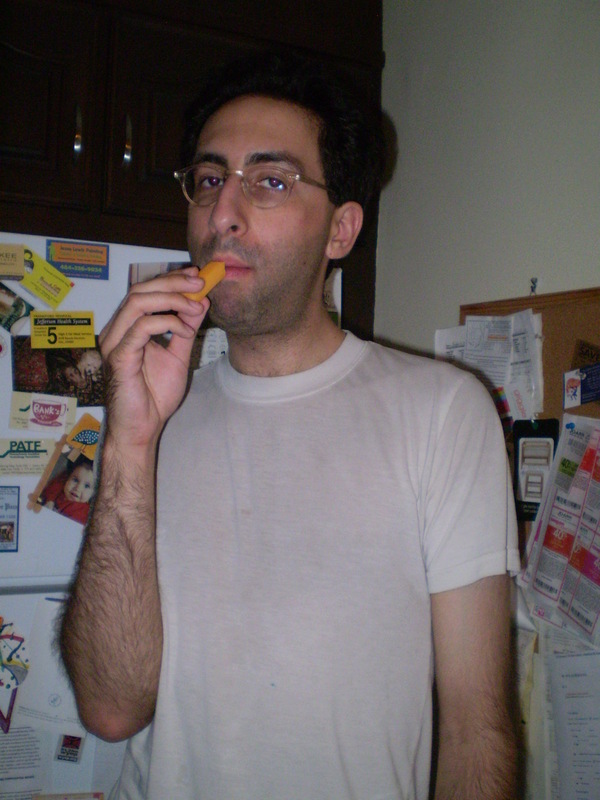 Mr. Apron prepares for his duties as fry cook with a little cheese stick pre-gaming. 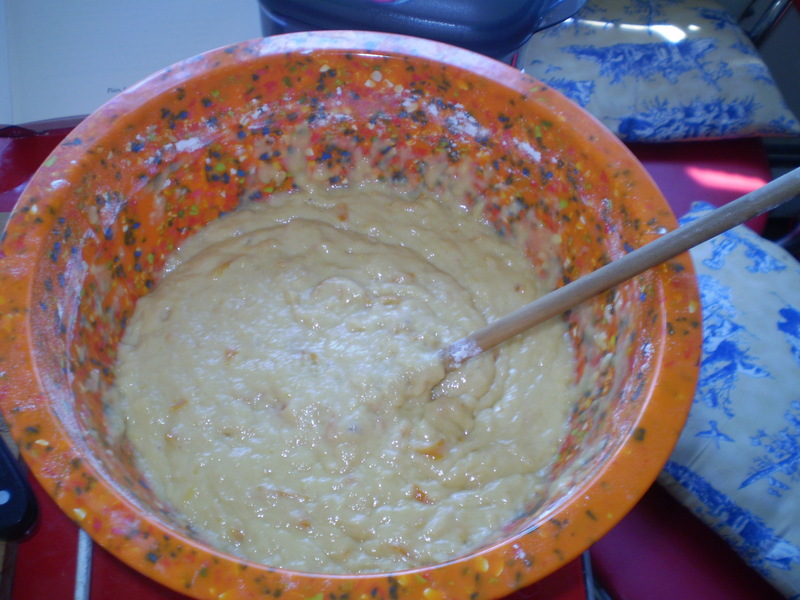 The appetizing batter, resembling a large bowl of baby vomit. I dip, I drip, I pose in my apron. Mr. Apron wields his mighty Fry Fork. The obligatory foodie pic, piled onto a BBQ "chicken" sandwich. Ready for the pregnancy bake-off? Preheat oven to 350 degrees. Butter and flour 2 9×5 loaf pans. Everything out and ready! Hello oranges! 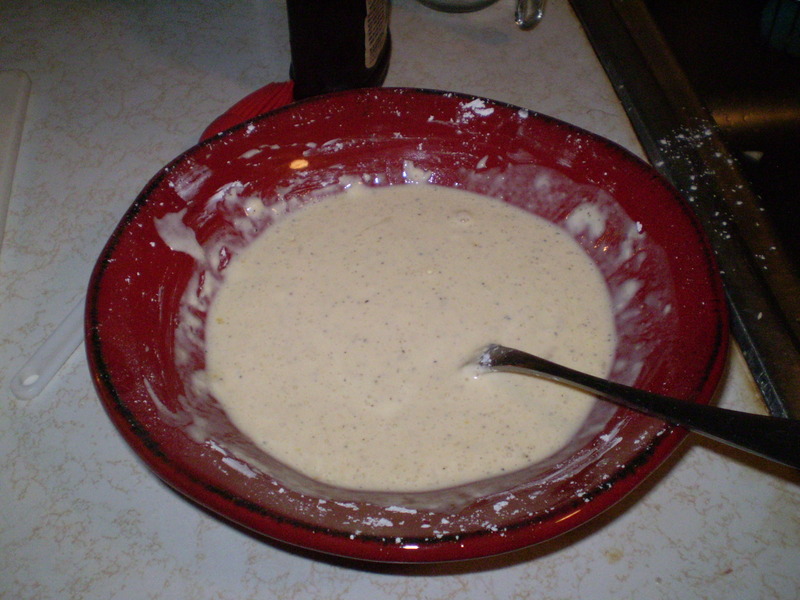 Sift together flour, baking soda, baking powder, and salt in large mixing bowl and set aside. 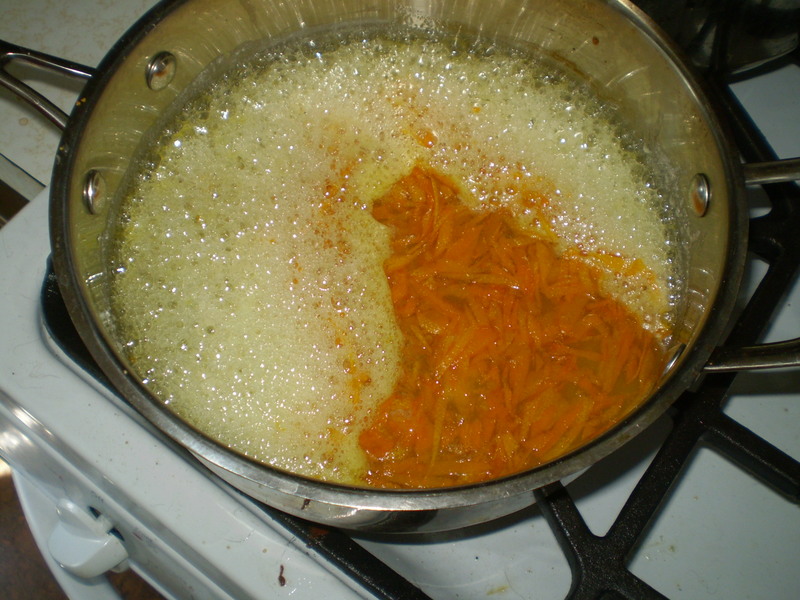 With a vegetable peeler, remove just the brightly-colored outer rind (not the white part underneath) of 2/12 oranges and reserve it. Do this in long, thin strips if you can. Cut the strips into long slivers. Squeeze the oranges. You will need 1 1/3 c. of juice. Set aside. Remove from heat. Add butter and stir to melt. 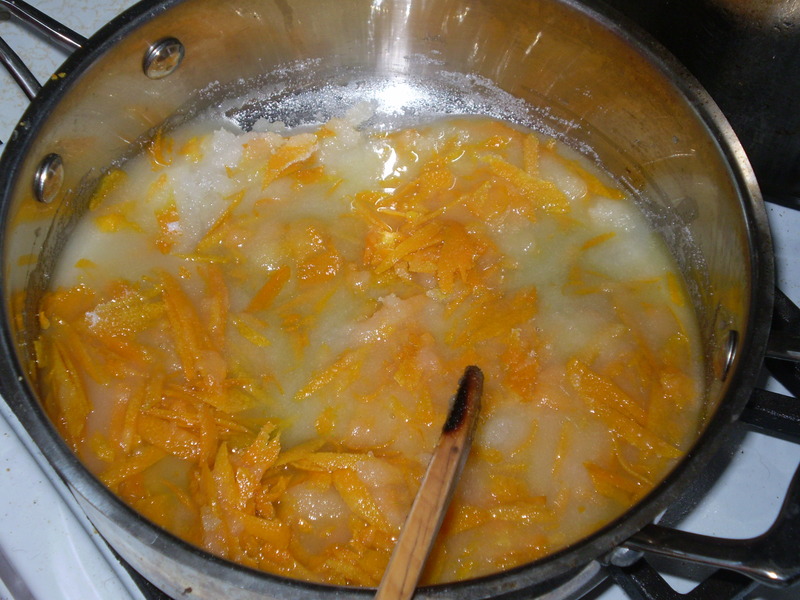 Stir in the orange juice. Beat the eggs lightly and stir them in. Pour this over the sifted dry ingredients and stir until dry ingredients are thoroughly moistened. Turn into prepared pans. Shake/tap to level batter. Bake 40-45 minutes (Ed. Recipe says 55min-1hour, but I found they were quite done at 40 min) or until a cake tester comes out dry. Cool in pans about 10 minutes before removing to racks to finish cooling. Serving suggestions include applying butter or cream cheese to toasted bread, or serving plain. It smelled so good, and Mr. Apron didn’t want to befoul it with any sort of spread, so we ate it plain, slightly warm. Very moist and delicious. Stay tuned next week — we are entering avocado territory. Thank goodness they’re in season! As a member of thebump.com, I am treated not only to weekly updates on fetal development, reviews of the hottest $600 strollers, and inane messages on the chat boards (can I paint my nails when I’m pregnant? ), but also to a fruit-size comparison. Every week, I can see which fruit’s length corresponds to my fetuses’ crown –to-rump length. And then I know what type of fruit is nesting inside me. 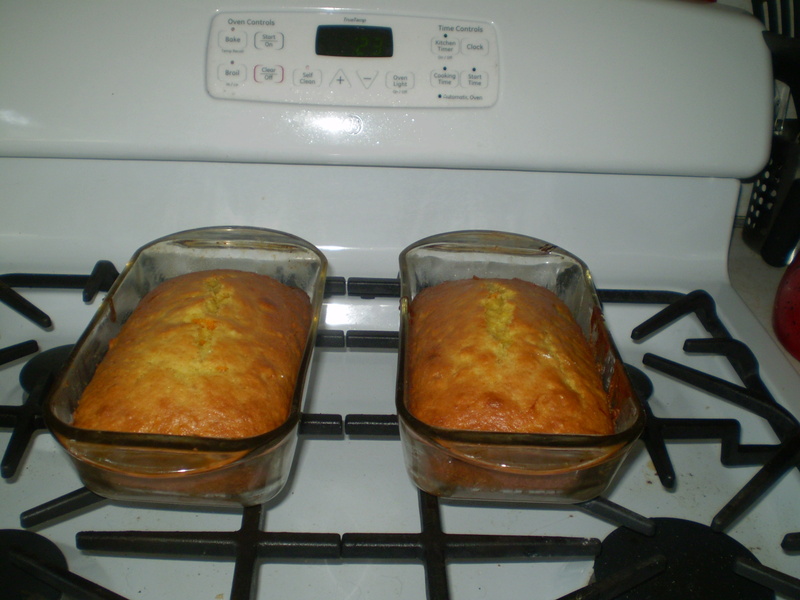 Last week, in honor of the twin lemons within my womb, Mr. Apron and I baked lemon nut bread. Only, we didn’t have walnuts, and I put them in cupcake tins, so Mr. Apron could take them to work on the weekend. They weren’t the most beautiful creations. Instead of rising and making pretty little mounds on the top, they exploded over the edge of the tin, but with enough lemon glaze, you wouldn’t even look at their aesthetics as you let the sugary lemony goodness melt in your mouth. This week, my parasites are the size of navel oranges. I thought since I’m a baking sort of person, and I’m currently baking two buns in my personal oven, why not keep up with my fruit-of-the-week and inspire a confection of the week? I may even take pictures in the future. 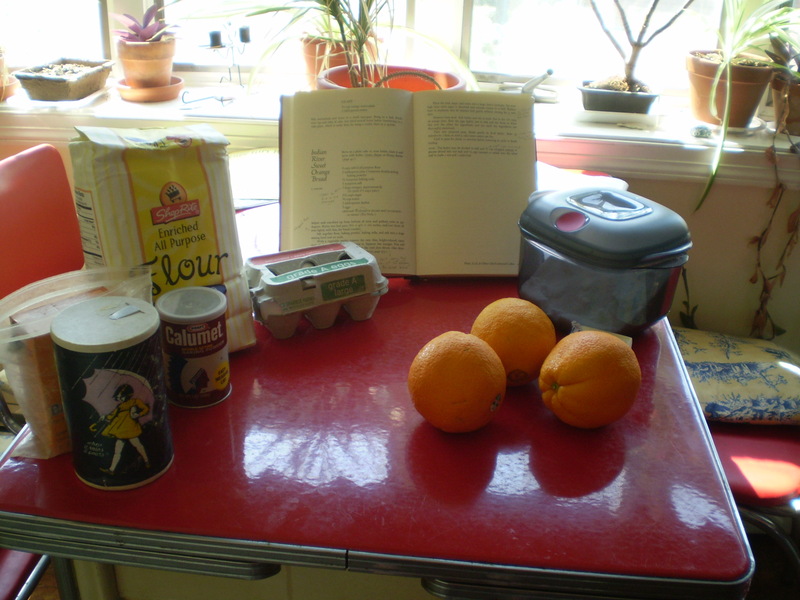 Thus is conceived the weekly bake-a-thon! And no, I have not yet been offered a book deal, but I will negotiate with the right agent.